What Does Summer Break Mean for Ministry? As humans, we definitely need breaks. But God doesn't. So how does God keep working through all of us while still providing rest and renewal in the summer? Ministry continues here at Advent, even as things are a bit slower. This summer has been a time of respite, new territories, quiet and warm mornings in the sanctuary, and eager anticipation of the future. A group of congregants relaxed in beautiful nature surroundings at our annual Congregational Retreat in June. We launched an exciting, ambitious new intergenerational and bilingual program, Summer Suppers, in July. Our sanctuary has been dotted with white paper fans on Sunday mornings as congregants stay committed to worshiping together, even on really warm mornings. Our Old Testament preaching series has delivered fresh sermons on texts that never get preached on in our regular liturgical calendar. 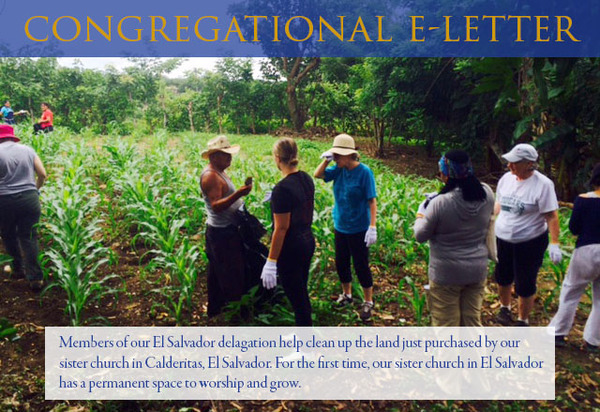 A group of us has traveled to El Salvador and back, returning with eye-opening experiences, real relationships, and incredible stories--many of which they have shared poignantly in their blog. All the while, we’ve been looking forward to claiming full use of our space in the fall, and our Call Committee has been at work searching for our new Senior Pastor. Wow, that's a lot. This last month of summer is a time of planning here at Advent, as our staff begins channeling their energy and creativity into our programs that start in the fall. But we don't want just our staff to be planning. They are supporters, facilitators, and leaders -- but this congregation is a body that takes every member to really come to life. You are valued part of this community, and your involvement this fall will undoubtedly enrich and enliven our ministry. The grace of this long summer break is that it provides the opportunity to reflect, plan meaningfully, and act intentionally. Why not use the respite of summer to reflect on how you will engage in community and service here at Advent this fall? What would you like to learn? What would you like to do with others here? How can you serve this community? What issues do you feel we should talk about or act on as a community? Have thoughts already about what would be meaningful for you to do at Advent this fall? Let us know what you're thinking. In the upcoming weeks we'll be sharing a great many opportunities for learning, service, and fellowship this fall. A few are already listed below. Advocate for a more diverse representation of our country at our National Parks and Monuments. Filling out this quick form will add your signature a petition by Creation Justice Ministry to make sure the stories of America's history that our Parks and Monuments highlight, as well as the workforces that staff them, reflect the beauty of our nation's racial/ethnic diversity and gender balance. Dinner, worship, and Bible study. Join us for two remaining Wednesday evenings of intergenerational and bilingual dinner, worship, and Bible study at Summer Suppers on August 3, and August 10. We are having a blast with great music, skits, food, and activities. Learn more. Catch the next sermon in our Summer Preaching Series this Sunday. Our summer preaching series on the Old Testament salvation stories continues this Sunday with a sermon on the Valley of Dry Bones preached by Pastor Ann. Watch previous sermons on our YouTube channel. Gospel Text | Luke 12:32–40: Jesus speaks about the Kingdom of God. Adult Conversation | Meets at 10:10am in the basement fellowship hall. Pastor Tiemeyer will lead a discussion about the day's readings.